OMG, it feels like ages since I reviewed a book and a romance book at that. This blog had begun to feel unloved! I had requested this book on the Making Connections group and somehow, being a short story, it slipped from my fingers and got lost between the tons of PDFs in my Download History. A day before my exam, when I was looking for a break, I chanced upon this book and began reading it. And I was glad I did. At the outset, I have to say, this isn’t a spectacular romance. I don’t know how a romance can be spectacular in say 60 pages, or maybe I haven’t read a romance short which has blown my mind. Yet. The book had a very intriguing start and a captivating blurb which is why I requested a copy. And I was intrigued to find out who Duncan was and who Isabel was. Their chemistry was palpable. It reminded me of my special someone and made me smile. But apart from that, the problem with a novella is the character development. I wasn’t entirely happy with the way the characters were developed. When Duncan praised Isabel, I could imagine her characteristics only because it was written as such. 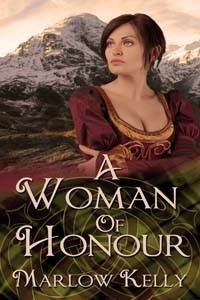 Isabel spent the whole book in a quandary about falling in love with Duncan, and about his clan, her appearance, and delivering a letter to King Robert. I suppose a lot of my feeling comes from inadequately knowing Scottish history, so in that sense, the review can come off to be a little naive and lacking knowledge. Duncan was a good and strong character, he was tall, muscular and broad. He knew what he wanted and went shamelessly after it. Isabel was conflicted and devoted. She was also naive and inexperienced. She’d been misled all her life into thinking she was a nobody. I didn’t really understand why the MacDougals were chasing Duncan and what tiff he had with his family. I refer to my lack of knowledge and I’m conflicted about letting it slide. A major part of the book relates to Duncan and Isabel escaping the clutches of the MacDougals. At one point, the MacDougals come close to Campbell (Duncan’s family) land and there another chase ensues. I thought this last chase was chaotic. Another grouse I had with this book was that it was trying to rush things too much. The end went absurdly quickly and everything was a happy ending, whereas it didn’t really seem like it. The ending seemed rather forced. I did like Isabel and Duncan’s chemistry. I could feel the lust and the passion. That the book did not lack. But I felt the lack of a deeper understanding between the lead characters. I didn’t understand the significance of the letter that Isabel had and somehow I didn’t feel any spark between the two characters. There are some books where a connection between the lead pair is so evident, it jumps off the page. This lead pair however, had a muted chemistry when it came to knowing each other and character development. I still laud the author for writing a concise short. I am sure this would have been an interesting one had it been slightly longer. It matters so much more when the only things binding characters to each other is a deep understanding and not just lust. Somehow I felt that all the running that the characters did, diminished the chances of building a relationship. The time span was too short for them to build anything and that was a let down.